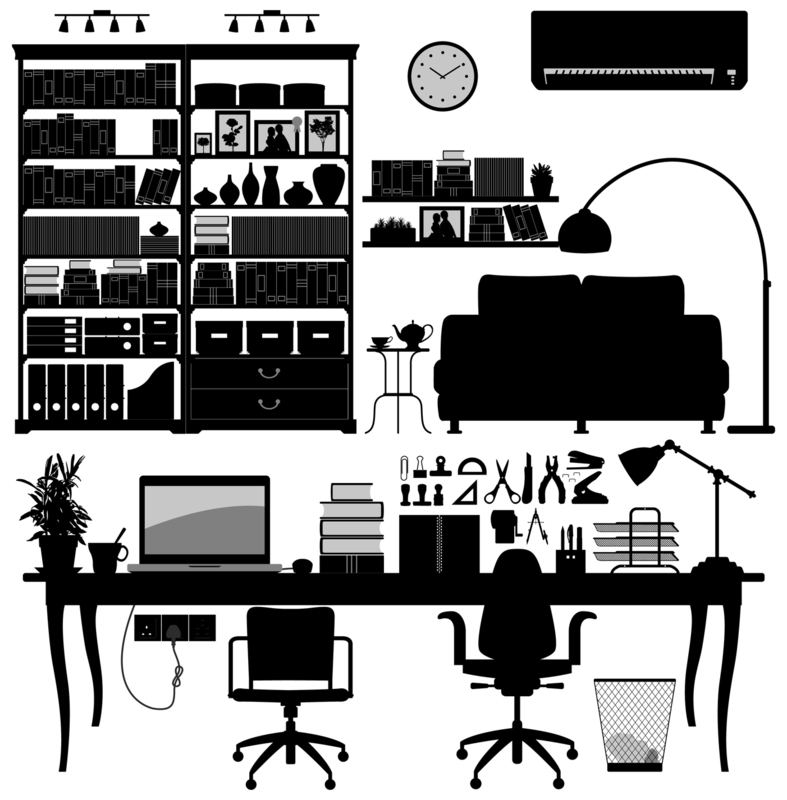 Working at home requires setting up a space that will work for you! It can be a challenge to carve out a spot to get your work done, just because there are lots of distractions. Decide on what works best for you! Some families relinquish the dining room to become an office, some families work well in the midst of the media area. Decide if you need quiet or not, paper management and printing capability, and what tools you will use to work. You are ready to set up your space after thinking this through. Set up office hours. With a start and end time, your time will be most productive. Paper and work go hand in hand. For portability from the office, there are products suited just for this! You can also set up a command center for work at home and work at the office with the same tabs keeping paperwork consistently. A file cart is a great option to slot papers in, keep them close by, and keep them organized. Decide on a time you will shut down for the evening. Working at home can interfere with a good night’s sleep. Sleep is the best way to work efficiently and effectively! Send One Suit and Make a Difference! Join me in participating in this year’s Dress For Success Houston’s S.O.S. (Send One Suit) Drive. The effort, formerly known as Clean Out Your Closet Week, provides interview suits, confidence boosts and career development to more than 45,000 women in over 75 cities each year. Dress for Success is a not-for-profit organization that helps low-income women make tailored transitions into the workforce. 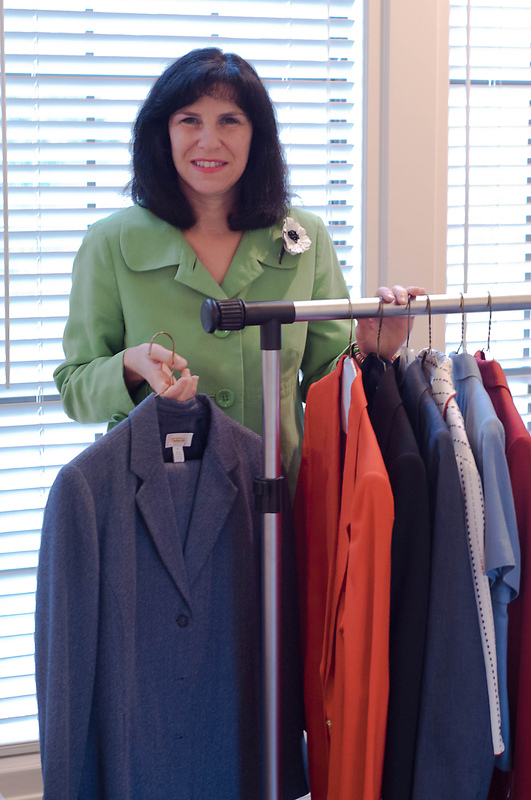 Each Dress for Success client receives one suit when she has a job interview and a second suit when she gets the job. If you would like to contribute, please bring your interview appropriate suit in excellent condition, cleaned, pressed and on a hanger to Kingwood Country Club on March 6, 2013 from 5:00 – 6:30 p.m. Matching jacket and pants or skirt are excellent donations. Don’t have suit to donate? Dress For Success Houston suggests donating $75 toward the cost of a suit for clients over size 14. Receipts for donations will be sent directly by Dress For Success Houston. For more information call 281-360-3928 or email edelap@professional-organizer.com. Want to find a local donation location? Visit http://www.dressforsuccess.org/affiliate.aspx?pageid=1&sisid=30. Many donation drives will be held March 4 – 8, 2013.
https://professional-organizer.com/WordPress/wp-content/uploads/2016/07/logo.png 0 0 Ellen https://professional-organizer.com/WordPress/wp-content/uploads/2016/07/logo.png Ellen2013-02-14 17:50:212013-02-13 17:54:43Send One Suit and Make a Difference! E-books are one of the many resources I use to help my clients move forward with organizing. These help my clients make decisions, find ways to make clutter disappear and help create baby steps in organizing. Donna offers us many different ways to make money from decluttering. Her various strategies work for each of us. How to Organize (Just About) Anything by Peter Walsh. Peter helps us create a vision of what we want and follow through on making systems and routines that work. What ebooks help you organize? Powerful productivity come when we create an environment that works with our strengths. Improve your effectiveness and efficiency with these tips. Your planner is the visual guide to your productivity. Use it like a map, writing in what your destination is for your day, your week and longer. When you write tasks and projects into your planner, you are making yourself accountable and breaking the job into smaller, manageable pieces. Use paper management skills to go from overwhelmed to in control. Break down the flood of paper by eliminating first what is junk and recycle this. Create a command center where you drop recycling in and separate the paper into actions. Your command center should be at the spot where paper comes to you and you drop it in a pile. Create a fun and inviting command center using color! Not sure what decisions to make about paper? Be brutal and just keep what you absolutely need to work on, not maybe, someday projects. Turn overwhelming email into 10 in your inbox by taking time three times a day to sort and clear email. Color code your email and important email stands out. Designate a power period to work on email that needs lengthy responses and relates to projects. Your paper and email folders should be named the same to keep consistent and find what you need. Add routines to your week to consolidate activities. Even grocery shopping is less stressful if you tack it on to an existing weekly activity. Too much to do and too much on the brain? Use a notebook to capture your lists, dating the top of the list. Then choose 3 – 7 tasks to do that day. 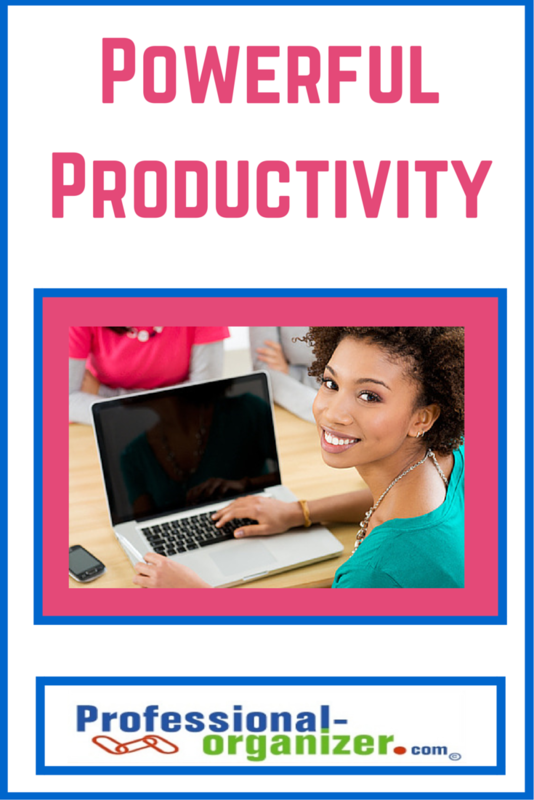 Use technology to help you increase your productivity. Turn off alarms, email, texting and more when you really want to focus on a project. What success tips do you have for plentiful productivity? More ideas on powerful productivity here! 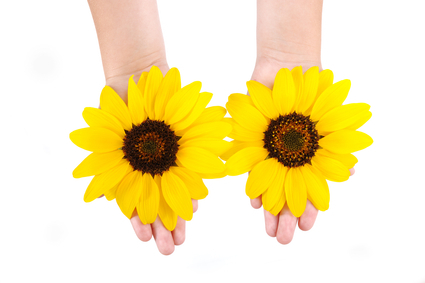 What makes you spring into action? For me, I will be assured of starting and finishing a project when I double up. I link two activities back to back that I love. (Or at least love one of them!) I will file when I watch foodtv. I will support a cause when I add in another team member that I work well with. I have joined committees and become a board member because it was fun, easy and rewarding to be a valuable team member. No one wants to be left in the kitchen alone. My DH and I partner to unload the dishwasher, fold the sheets, and make dinner. You can create all different partners in your family to get this done. Double up dinner recipes! Freeze part of the recipe for another week. What is one way you get the little stuff done? 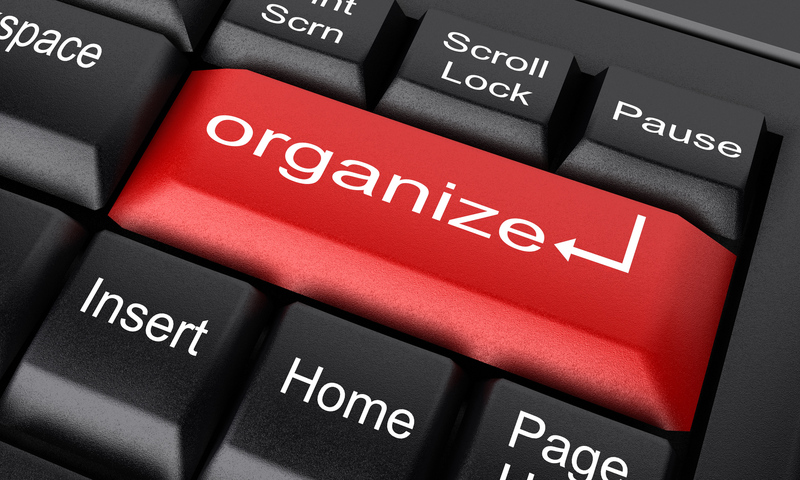 What organizing strategy works best for you?